It's not easy being eco-friendly at Christmas, but a tight budget is no excuse when you can make your own tree and decorations. 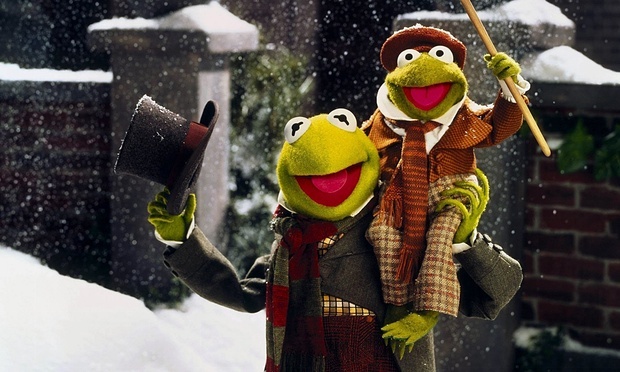 It’s not easy being green, sang Kermit, so to get everyone in the eco groove at this festive time, some creative inspiration may be needed. From courgette penguin decorations to microbead-free toiletry gifts, here are a few ways to help you keep it green this Christmas. In fact, decorate anything you like with fresh greenery if you have access to it (no “borrowing” from the neighbours). This is miles better than garlands of synthetic tinsel that will eventually end up in landfill, potentially via an intrigued pet’s stomach. In the colder months, fruit and veg provide endless opportunities for sparkling up student digs. See if your local market has any citrus fruit past its best and going free. If so, orange and lemon decorations are easy to make and look amazing. Failing that, try fashioning some courgette and carrot penguin decorations – all you need is some carving skills. Some think that covering their whole house with Christmas lights and setting them to flash in time to Gangnam style is the thing to do at Christmas. Think again. Instead, keep electricity requirements to a minimum and have a go at making a festive wreath that won’t cost the earth. Student accommodation is not generally designed for full-sized Christmas trees, so take inspiration from the courgette penguins above and experiment by making an edible cucumber Christmas tree. If your local shop is out of cucumber, fret not: these broccoli and kiwi trees are also a good choice - just make sure you use whatever is local and in season where you live. “A few years ago, my mum bought these sturdy branches from a local tree surgeon. Every year we get them out, still in pristine condition, and arrange them in a huge pot like a giant bunch of flowers. With Santa racking up a hefty carbon footprint with all that flying, not to mention Amazon’s dirty dealings, it’s pretty important to ensure the gifts we give are as planet positive as possible. Etsy is a great site for sourcing affordable handmade items, and may offer inspiration for your own crafts. Then there’s Po-Zu, a sustainable footwear company that ensures no nasties go into the making of their shoes. If footwear is out of your budget though, check out their edible shoe cream. Based in Southampton, Who Made Your Pants? buys end-of-season fabrics and turns them into spectacular underwear. These stylish knickers are made by women, many of whom are refugees from war-torn countries, and, because it’s a worker cooperative, every member of Who Made Your Pants gets a say in how they run things. Amazon - you’re done for. To wrap all these gifts up, think about doing something a little different, like buying several copies of The Big Issue. Not only do you get the chance to support a good project, you won’t be adding to the 227,000 or so miles of wrapping paper predicted to be used this Christmas when you then upcycle it as wrapping paper. There are many ways students can help the community during the festive season. Mary Christmas is an initiative set up by students from Queen Mary University that aims to reach out to the homeless on the streets of London. By the time you’ve done all of the above, you may be ready to collapse into an exhausted heap. At least you can nap safe in the knowledge that it’s pretty easy being green after all.